The indeed.com average salary for drivers is $972.00 per week. 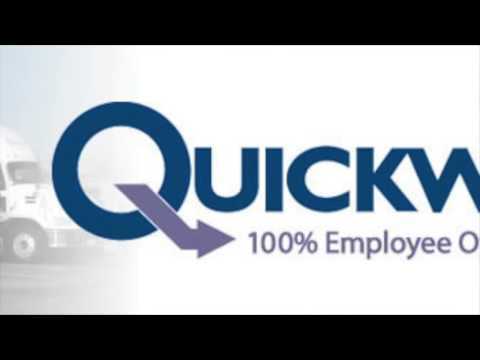 I must say that even though the terminal I run out of has high turnover I am happy with quickway. We haul milk for deans milk, the run that I have is south illinois and m.o. And with that run I work Monday Wednesday Friday and a local on Saturday and average $1200 a week. Btw home terminal is louisville ky. The miles are on a sliding scale...and to be honest with you I don't remember the scale off hand but I can tell you that under 200 its 44 cents a mile and over 500 it goes down to 34 cents. There's also 14.35 for stop pay and with the accounts here in illinois they want their milk on the floor so that's another 20 dollars per store. Let's just say overall I average 50 cents per mile. Some new information on Quickway Terminal #52. A few months ago, we changed dispatchers. Our terminal in Conroe Tx should have the majority of Houston Routes but for some reason I am stuck going far south of Houston...a 600 mile round trip. The older Macks that are set at 59 MPH and one of them is mine. I am looking for another job. In my year at Quickway, I have watched as the driver quality has diminished. If you are good at hauling milk, you will be going to the extreme delivery areas and what you can't do in a 59 MPH truck, you will be expected to make up for in being faster at the stores. If you dump pallets of milk all over the dock, you will be rewarded with some easy job like driving to Kansas. I don't know how it is elsewhere, but this is the way it is in Fort Worth. What needs to happen is the dispatchers need to ride on some of these routes they dispatch. The worst thing a driver can do is to actually do these long distance routes because they will expect you to do another one next week with another 20 miles added to it. If you could actually GET to Houston before rush hour it might help. But when the route starts at 1 PM in Fort Worth, this is going to put you right at the peak of rush hour in Houston. I cannot recommend this job to anyone. It takes an OTR commitment to what is supposed to be a local job. A 17 hour route with only 15 hours to do it. I know I will be sitting on the side of the road tonight, waiting out my time so I can get back home. This is with no stopping for anything. An employee owned company where the employee has absolutely no say on how the place is operated. Never the same route, always different. Can't get the store to let you in as the dock closes at 12 noon and after that they are in no hurry. All this at 59 MPH, no set days off, never the same stores. Not quite yet...I know that this could be one bad to the bone job! It could be the kind of job that drivers stand in line to get. And like I say, it may be a different story elsewhere and it may be because of the miles involved hauling in Texas. Most Kroger stores here in Texas and Louisiana will not answer the back door, so you have to walk around the store adding to the time involved to unload. We started a new service for America's Beverage Corp (Kroger) and in the three weeks I have been assigned to it, I have actually hauled twice. We are leasing 6 trailers for a job that actually is iffy at best. It pays good when it goes but the day shift guy is slowly being starved to death. The senior drivers (the vested ones) pretty well choose what they do. We have one that drives the nicest Pete in the yard. Walk in sleeper and all the bells and whistles but he never does a route that he has to sleep in it. What a waste. These are the group of drivers that came over with DLH trucking when Quickway took it over. Sometimes it is best to start fresh instead of keeping what made the former company lose the account in the first place. That is why my former company, Farm Fresh Dairy and Bakery Products is no longer in business. They refused to change the way treated the drivers, always a lot of turnover and resentment. Farm Fresh had a driver die in crash when I was with them. 980 miles, 22 stops and about 26 hours straight with one driver. Their answer? They hired a safety consultant made up of ex-highway patrolmen to tell the DRIVERS that they were at fault! That almost got the Teamsters voted in! Typical trucking company, blame the driver for everything wrong about their own company.